Putney leisure centre has newly upgraded changing rooms and some of the latest gym and fitness equipment following a £400,000 modernisation and refurbishment programme. The centre’s state-of-the-art gym has been enhanced with the introduction of new V-Plates pro vibration machines, TRX total resistance exercise equipment and Techno Gym indoor cycling bikes. In addition, all the other cardiovascular equipment in the leisure centre’s Kinetika gym has been replaced with the latest range of Precor Fitness machinery. The new changing rooms include new vanity units, benches, lockers, flooring, tiling, toilets and showers. The changing room upgrade, which has been funded by DC Leisure, which operates the borough’s seven leisure and sports centres, is aimed at their customers who have an all-inclusive Kinetika membership. This enhanced level of gym membership offers five 1-on-1 training sessions, unlimited access to the gym, group workout classes and use of the leisure centre’s swimming pool – as well as the new changing facilities. The improvements at Putney are part of a wider sum of £825,000 being spent by DC Leisure on improving sports and fitness facilities across the borough. 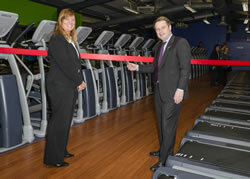 For more information about local leisure centres, where they are and what they offer, visit www.dcleisurecentres.co.uk. Alternatively follow Active Wandsworth on Facebook or @activewands on Twitter for all the latest news and offers.